The American Chemical Society is "dedicated to improving lives through Chemistry", according to their website. The site features extensive resources for middle school science including experiments, worksheets and presentations. 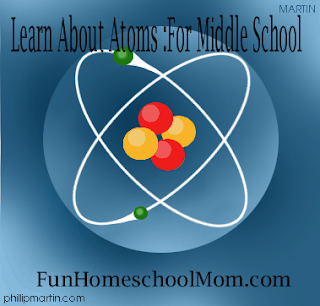 Included are lessons about atoms and molecules. I used simple science experiments from Bright Hub Education to demonstrate basic facts about atoms and molecules for my science students. The site also has many other science resources, including lesson plans and worksheets. The NEOK12 site is full of videos, lesson plans and most impressively, quiz games. Their quiz games are interactive assessments of the student's understanding of the material in a Quizlet-style flashcard simulation. I found a very informative series of videos by Dr. Brian Cox on YouTube on the topics of the development of various parts of the atomic theory/particle physics. For a more younger child-friendly version, check out this YouTube video of Bill Nye the Science Guy discussing Atoms. I will watch these with Chase through this week. Remember to set up your teacher YouTube channel as I blogged about in an earlier post. My YouTube Channel, with even more videos, including musical videos about atoms and molecules, can be found here.